I’ve worked for myself since my senior year of college. As a self-employed freelancer, I never started a 401(k) and starting an IRA seemed overly complicated. However, by 26 I realized I was late to the game and I sat down with Schwab broker. He explained some choices and we picked a ‘safe’ mutual fund, so I could start my first long-term savings plan, an IRA. I set up a monthly deposit and breathed a sigh of relief: I was on-track to retirement. A few years later, when Stocks for the Week released it’s free Wealth Calculator, I typed in my numbers—I smugly assumed all was perfectly on track—and I was surprised to see that I needed to double my current monthly investing numbers to even come close to my long-term goals. Gah. What a blow. What to do next? Though I’ve been researching and studying the stock market, and I’ve taken most of these steps, I still wasn’t quite ready to invest in the undervalued stocks recommended by the MPI algorithm, nor did I have a sum from which I could do this. Instead, I needed an interim step, which is when I looked into the automated online investing world. In researching though, I discovered that Wealthfront has strong reviews and usability, but is a better option for investors who already have significant cash they’re ready to tie up in investments. And Acorns is also a solid option, but perhaps for someone very, very new to investments (this is a slow-trickle savings platform if you can’t commit moderate monthly amounts to your long-term savings). I fell somewhere in the middle; I wanted to invest little upfront cash but still have full automation and strong investment options. Ease of use: Betterment has a slick and clean interface with access to all the information you need to understand your accounts and goals. The options are clear options and I love that each section has pop ups with explanations and recommended advice to consider. It makes it a clear advantage of more advanced platforms that expect you to understand every aspect of your portfolio. Risk assessment: The site is designed to really clearly delineate goals and investments by risk versus reward. This is important for new investors (like me) as it is deeper knowledge than I have readily accessible and was a major reason I had put off investing for so long. 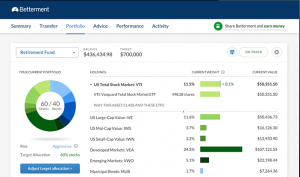 Customized portfolio allocation: Each new user sets up at least one “goal” to get started. You can have several of these, and each goal acts as a separate portfolio that can be used to assign a specific ratio of stocks/bonds. The site also offers recommended advice on how you should split your money depending on the length of time you plan to invest those funds. Mix of stocks and bonds: Instead of throwing in the kitchen sink of options, their choices are slim but effective. And instead of trying to suss out and directly pick where to put your money, you use that risk assessment and allocation goals to split your funds between Bond Fund ETFs and Stock Market ETFs. Fully automated: This is a strong selling point because the Betterment algorithms take care of everything from rebalancing to tax loss harvesting. Once I linked my automatic deposit from my checking account, their service automatically pulls out my monthly amount and invests in according to the split we chose for each investing goal. I can set it and forget. And that was the point. There are a lot of areas of the stock market I still need to learn, so I like the fact that I can watch my Betterment account and learn how they manage and rebalance funds to keep everything on track. Picking investing goals is simple and their automated system will then help you choose an allocation ratio between stocks and bonds that makes sense for your goal and timeline. Quarterly fees: This is a pro and a con because they do charge a flat percentage on a quarterly basis. Compared to others in the automated investing industry, however, these fees are very low and competitive considering the extensive features offered. Market risk: Betterment is an investing platform, so moving over my safety net fund was a big step. But the use of EFTs, and by mixing up the blend of stocks and bonds in each fund, I feel like Betterment does an effective job of lowering risk. That being said, you have to invest knowing you could lose money, which is true of every platform, not just Betterment. Fully automated: If you’re looking to actively trade stocks and really have strong control over where you’re investing your funds, this is not the platform for you. This post explains other options if you’re a bigger investor and don’t need to pay for the automation aspects. The site is fully automated, and the dashboard has a clean interface showing allocations for each of your goals, as well as a simple way to view your balance, as well as your earnings on that goal. Build Wealth: In this goal basket, you should consider setting up a monthly deposit and set your shorter-term goals. It’s this fund that you can later pull from for individual stock investments and other long-term goals. For now, the money is split between stocks and bonds depending on how many years you plan to leave the money in the account before striking out on your own. If you’ve been studying the stock market and are thinking using MPI and investing in individual stocks, consider 2-10 years as your goals for this account. Safety Net: I had my six-month fallback money sitting in my savings account, even though I have read for years that there are more effective places for that fund. Once I signed up for Betterment, I realized I could choose a low-risk split between stocks and bonds (they’ll give a default recommendation) and maximize my chance to grow my safety net fund. But, being a safety net, the funds are also instantly accessible if I need the money—you can transfer the funds to your bank account within just a few business days. The last step: Sit back and don’t get antsy! It’s a little overwhelming to check and see the daily fluctuations when you’re new to investing, but each of these accounts are optimized for a specific length of time, so don’t worry about the daily changes—you’re in this for the long-haul! 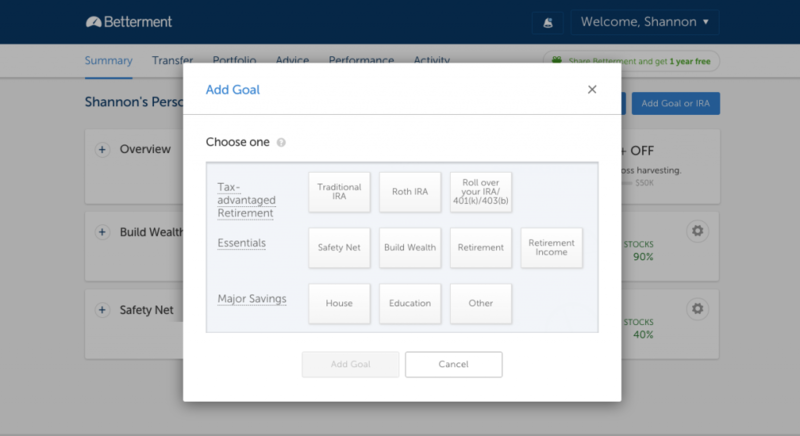 Why not check out Betterment and see if it’s the right next investing step for your long-term wealth goals.